NEW YORK　（NBC News, Oct 1 2016）— Chants of "Allahu Akbar" are not what you'd expect to hear at a Brooklyn baseball diamond directly after "The Star-Spangled Banner." But a 29-member all-Pakistan squad that last week visited the U.S. seeking a berth at the World Baseball Classic brought a new flavor to America's pastime. As a former British colony, the world's oldest Islamic republic is cricket crazy. While the games are cousins, baseball hasn't caught on in Pakistan. It's not an intramural or a varsity-level sport in schools or colleges, and the only diamonds around are those nestled behind barbed wires guarded by Marines on the U.S. Embassy's high-security compound. However, Pakistan manager Syed Fakhar Shah says the cricket connection gives his team an edge. 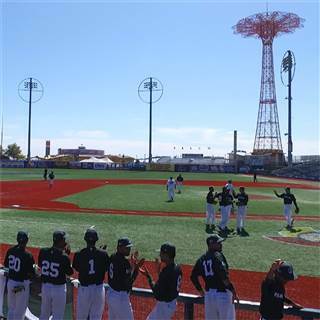 "There are a lot of similarities in the two games," he told NBC News as the team played Brazil at the MCA Park on Coney Island on Sept. 22. "They have 11 players in in cricket, and we have nine in baseball. But you have to run, hit and throw in both. You have three common things in the same game. That's enough to make a lot of good cricketers into good baseball players." Baseball's emergence in Pakistan has been closely linked to its cricket successes. In 1992, Pakistan won the Cricket World Cup, the biggest trophy in the game. The same year, baseball was introduced as an Olympic sport. That's when Syed Khawar Shah, known as "the father of Pakistani baseball," and the current manager's father, went to work. "I figured that if we can have the best bowler and the best batsman in the world of cricket, why can't we have a decent pitcher and a decent hitter?" said Shah, a former Pakistan sports board official, proudly watching outfielder Muhammad Zawar lead off the top of the first with a clean base hit. Shah managed to score a shipment of used equipment and VHS tapes of major league games from a network of churches in the U.S. — and baseball had arrived in Pakistan. Shah and his son — the team's eventual manager — went to schools and colleges across the country, getting people who had never worn a mitt involved in the game. Eventually, he got Pakistan's army, police and an energy company involved to sponsor independent teams. Almost a quarter-century later, he finally brought the national squad to America. "I feel Pakistan can be a great team. It already has the talent, but it needs the facilities," Shah said. "Forget a pitching machine. We don't even have a baseball field in the country. Yet, we are here, because we're ranked 23 in the world." Gary Perone, assistant general manager of the Brooklyn Cyclones, helped facilitate Team Pakistan's visit. He was enthusiastic about hosting his South Asian guests. "There's a Little Pakistan here, in Brooklyn, and they were a perfect fit for us," Perone said. "As time goes along, the local Pakistani-American kids, who are Mets and Yankees fans, can get interested and learn the fundamentals of the game through these guys." He added: "They're doing better than we expected. They've got good energy. Baseball is for everyone, not just for Americans. If we can get a player to go back home and say that, 'Hey, baseball helped me out in my career, then that's great!'" Team Pakistan lost 10-0 to Brazil in their first game and 14-0 to Great Britain on Sept. 23. A mercy rule ended both both games early. Israel won the four-team battle to qualify for the final spot at next year's World Baseball Classic in South Korea. But Silas Mullis traveled all the way from Kansas City to support Team Pakistan. "Coming together in the face of adversity, going up against serious pitchers, that's a big moment for a small team," he said.